Independent Living means I get to help people stay in their homes. Consumers get to live the life they want with the extra help they need. Attendant Service is the consumer-directed physical assistance with personal care which a person with physical disabilities cannot perform because of the limitations or impairments resulting from a permanent physical disability. 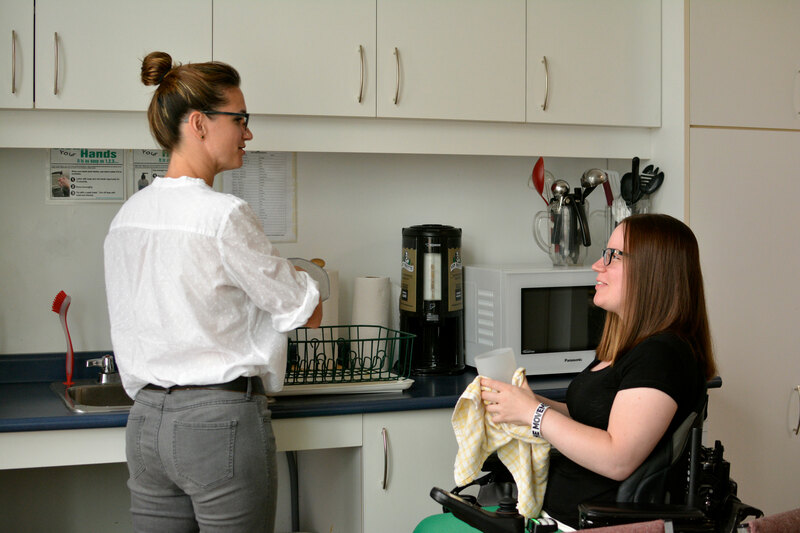 Attendant services allow people with physical disabilities to lead full, active and independent lives in Waterloo Region. Services can be provided at home, at work, at school, or out in the community. For more information about the program or eligibility, please click on "schedule appointment" below. Note: There is a wait list for service. Prospective consumers are ranked in priority order according to their needs. Direct Funding is an innovative program which enables adults with physical disabilities to become employers of their own attendants. For eligible individuals who are comfortable taking on the extra responsibilities associated with Direct Funding, this form of attendant service is both rewarding and liberating. Undertaking the functions, responsibilities and potential risks of being an employer. Managing these employer responsibilities yourself, without relying on others. Report on a quarterly basis to the Centre for Independent Living in Toronto (CILT) on all expenditures. Be a fair and honest employer. Follow all Revenue Canada, Employment Standards and Human Rights legislation governing the employment relationship.